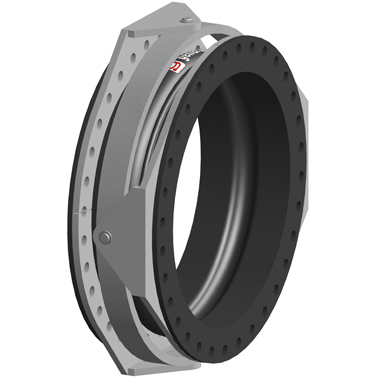 General Rubber's Style 5100G gimbal rubber expansion joint is designed to facilitate and isolate angular rotation in two planes. The arrangement consists of two pairs of hinge plates connected with pins to a common gimbal ring and attached to the external or internal hardware of the expansion joint. The gimbal assembly must be designed for the internal pressure thrust forces of the system. They can be used in sets of two, or sets of two with a single hinge design to absorb large lateral movements in multiple planes. This optimally designed arrangement represents an effective solution for absorbing large axial thermal movements from adjacent pipe runs. Its spool type body is constructed with full rubber flanges, a high-grade leak-proof tube, multiple layers of high-strength tire cord, high tensile steel reinforcement and a seamless cover. They are commonly used when the support structure or adjacent equipment have load limitations. The economic benefits of this arrangement include a smaller system footprint with far fewer anchors and guides.